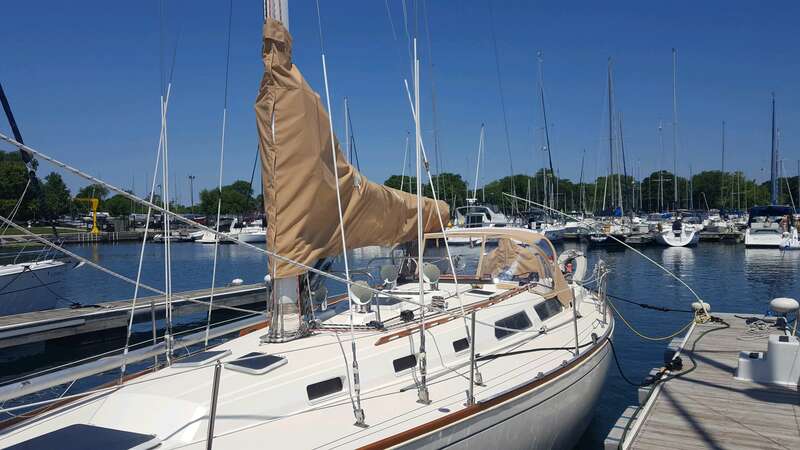 For this sailboat we created a custom dodger, helm cover, winch covers and sail cover. Here at Chicago Marine Canvas, everything we do is custom. We use many cost-effective, labor-saving tools that help us speed up the process, therefore you save some money. 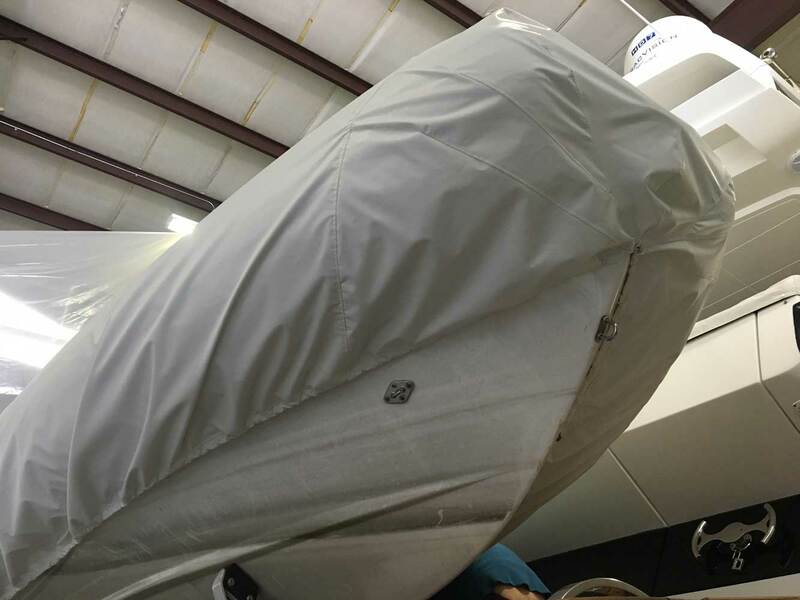 This also helps us make sure that your cover will fit perfectly when it comes to install time! 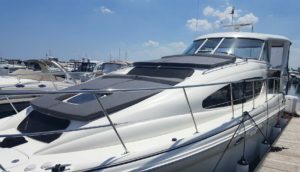 The first thing we do to begin our process is journey out to your boat. Once we get there we use our 3D measuring device to take precise pinpoint measurements. After we gather all of those, we head back to our shop where our designer gets to work. We use CAD (Computer-Aided-Design) Software during our design process. On the computer we can see the thing we can see the design in 3D. Making sure everything matched in color, we used Sunbrella fabric in the color toast. Sunbrella is one of our favorite marine fabrics to use when it comes to canvas, it comes with 10 year warranty. For all the things we sewed up for this job, we used SolarFix thread in clear, which has a lifetime guarantee. This means, no more restitching after your new canvas has been out in the sun for a few years! This thread will outlast the canvas it self! 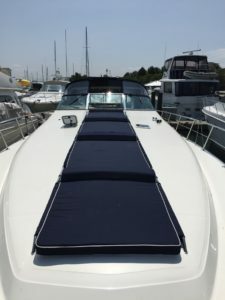 We made sure to add leather reinforcement patches on the forward and aft areas of the dodger where there would be high amounts of friction on the sailboat. For the windows of this dodger we used Strataglass. Strataglass is the only vinyl on the market that offers a 2 year warranty if it is properly maintained and cleaned. 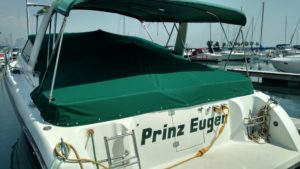 For this sailboat we also made matching winch covers out of sunbrella fabric as well as a matching helm cover! 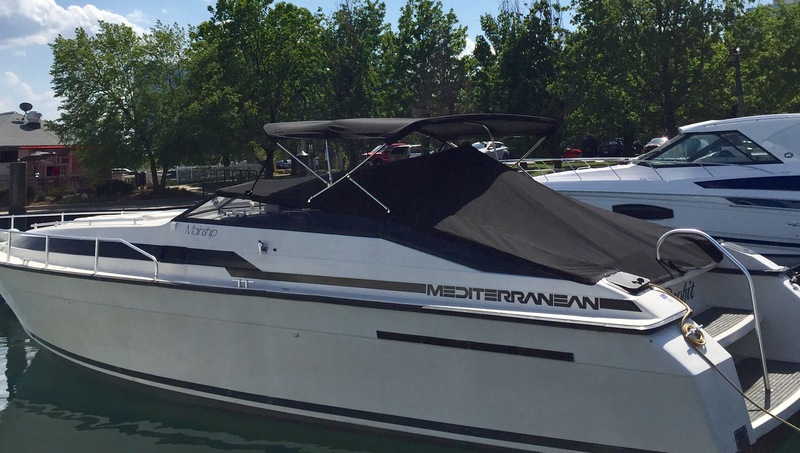 This SeaRay Sedan Bridge 390 had lots of deck space so we went a head and designed four custom sunpads to fit the bow of the boat. Here at Chicago Marine Canvas, everything we do is custom! So we can make anything you have in mind when it comes to design and functionality. 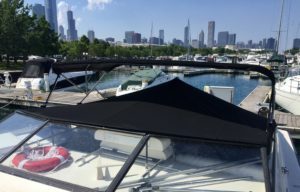 Did your last sunpad get taken away by the Chicago winds!? 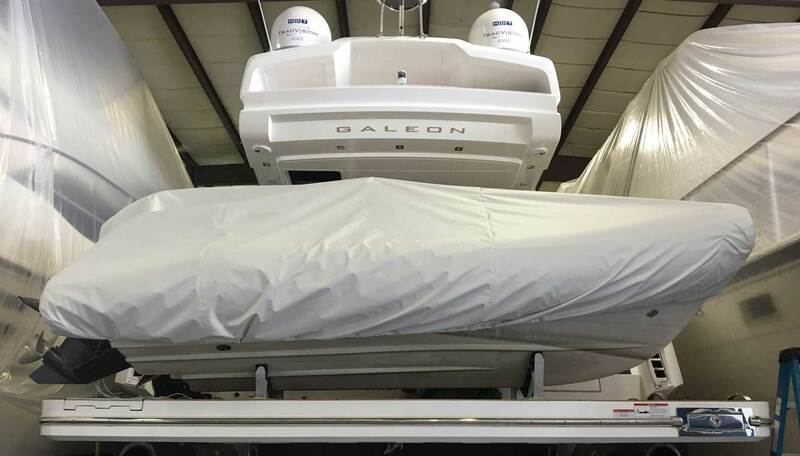 We can make sure your new sunpad is securely attached to your boat so you wont have to worry about it being gone when you come back to your boat! 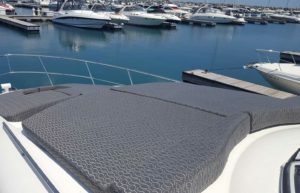 Is your sunpad looking drab? We have access to lots of fun patterns that can make your boat look chic out on the water this year. 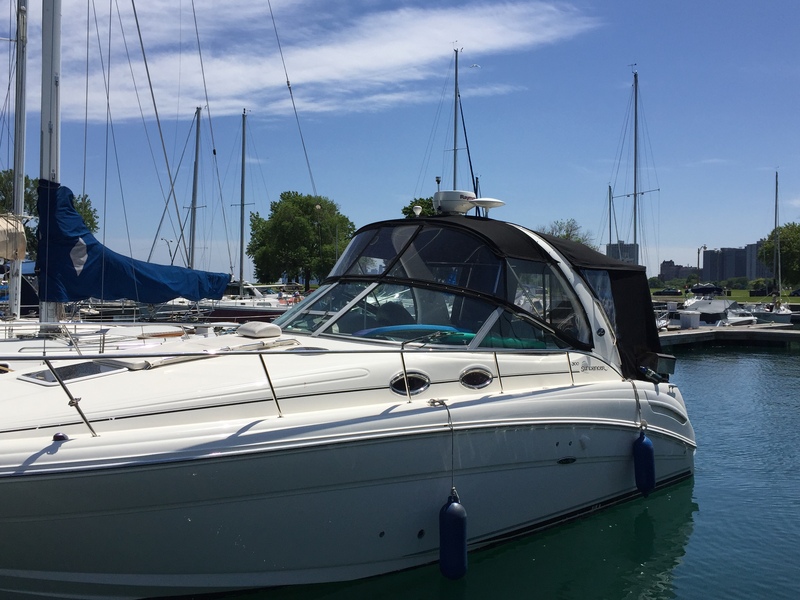 The first step to our process is going out to your boat to take measurements. 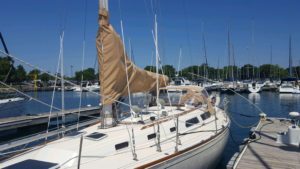 Here at Chicago Marine Canvas we use a lot of labor-saving, cost-effective tools. Our 3D measuring device is one of those tools! We quickly measure your boat and then head back to the shop to start our design process. We do all of our design work on the computer using CAD (Computer-Aided-Design) software. Once we finish that up, we send everything over to our plotter, another one of our cost-effective, labor-saving tools. 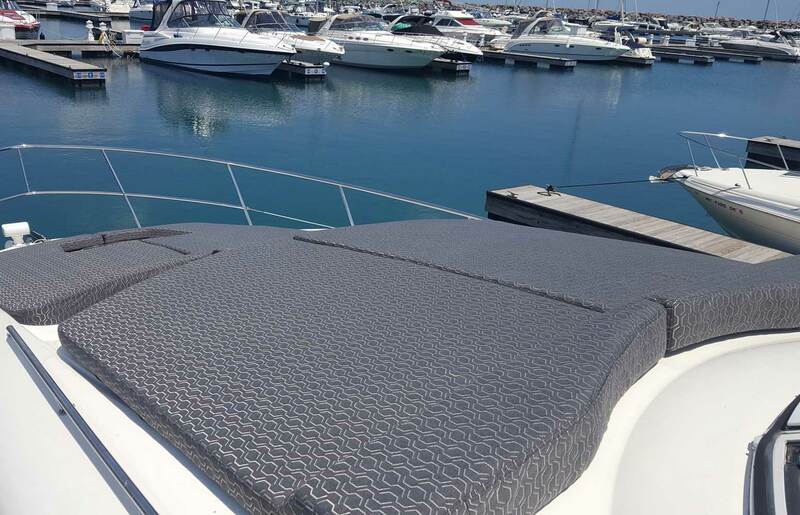 Our plotter draws out the pattern of your new sunpads perfectly! 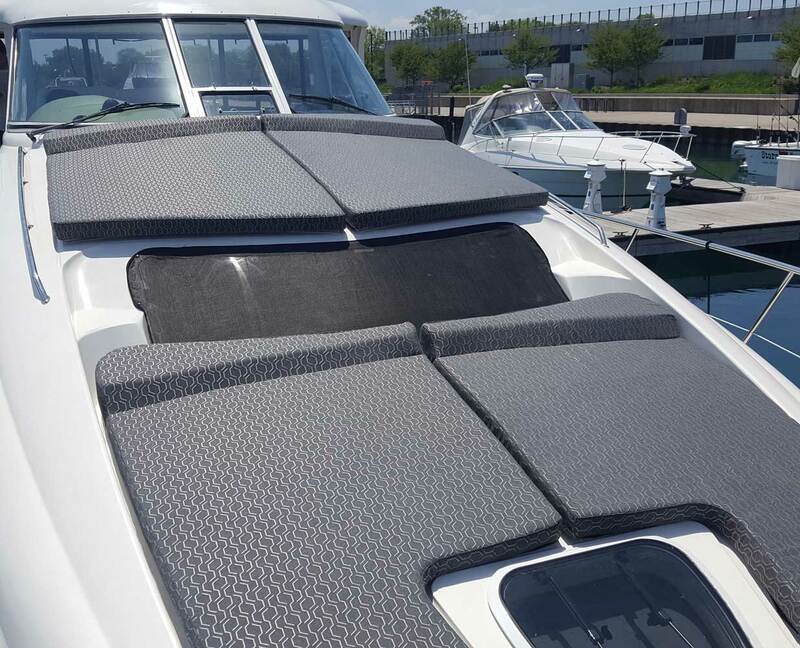 For these sunpads we used Sunbrella upholstery fabric in the pattern Adaptation Stone! We can make sunpads out of any material you’d prefer, but we recommend using Sunbrellla upholstery fabric because it’s softer on your skin, easy to clean in a washing machine, and has many different designs and colors available! Sunbrella upholstery fabric comes with a 5 year warranty. For thread we used Solar Fix which is a PTFE or a Polytetrafluoroethylene type of thread, which is also known as teflon, that is guaranteed for life! That means you can say goodbye to repairs that involve restitching. This thread doesn’t get eaten by the sunlight, salt water, or other outside elements. 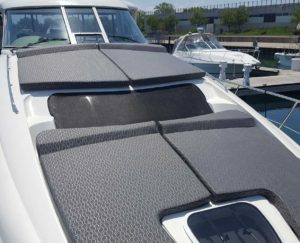 We used DriFast foam for these sunpads. Drifast foam is a firm open celled foam that is very porous. It allows water to run through it easily, instead of absorbing it like other closed cell foams. It even keeps you cool when you are on it due to the open cells of the foam allowing air to move freely through the foam. This foam is antimicrobial which helps prevent microorganism growth which happens in wet areas. 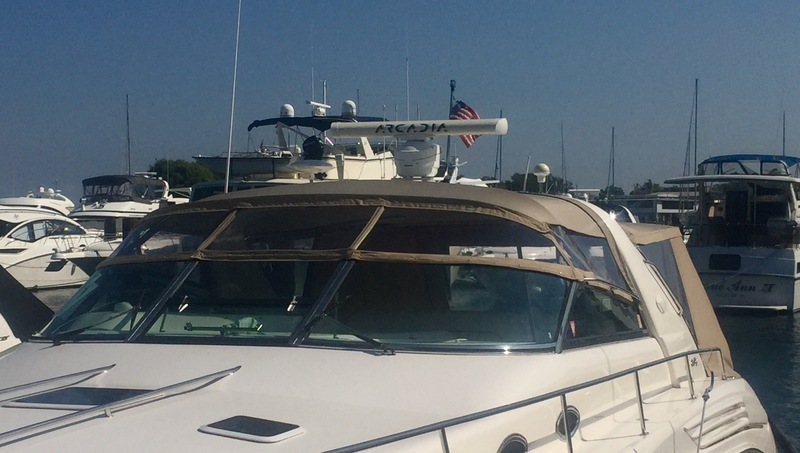 For this Sea Ray 500, the bridge was constricting the captain, so we raised the framing 6 inches for more headroom. 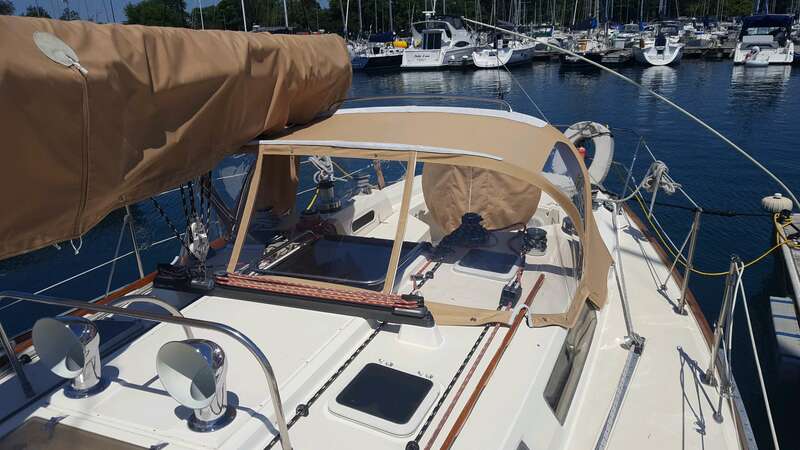 We also made a new aft frame for this boat so that the customers could have more shade with their new enclosure. 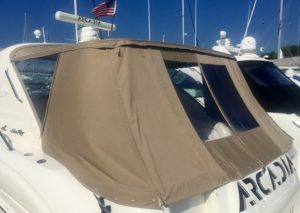 We brought the pole out further towards the back of the boat, so that the bimini could be wider then their last cover. After we did some adjustments on their framing, we went and took measurements with our 3d measuring device. Then our designer went back to the shop and started working his magic designing a custom enclosure. 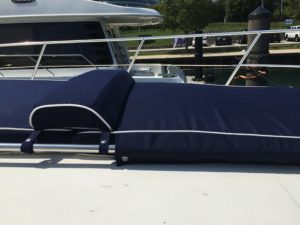 For this project we used Sunbrella fabric in Captains Navy, GORE tenara thread in black, Lenzip zippers. Both GORE tenara thread and Lenzip zippers have a lifetime warranty. That means they are guaranteed to last longer then your canvas and that the sun and water will not eat away at them! For the forward windows we used Makrolon, which is made out of a polycarbanate that makes these windows semi-rigid! 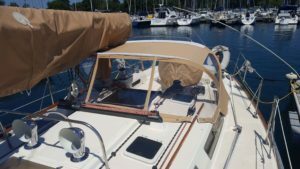 For the aft windows we used Strataglass. We did roll ups for some of the back windows for air flow when the cover is up. To ensure no water leakage in the roll up windows we used Lenzip’s waterproof chain zipper. 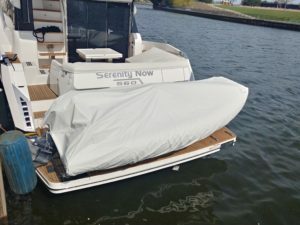 We also designed and sewed up four separate custom sunpads for this boat. 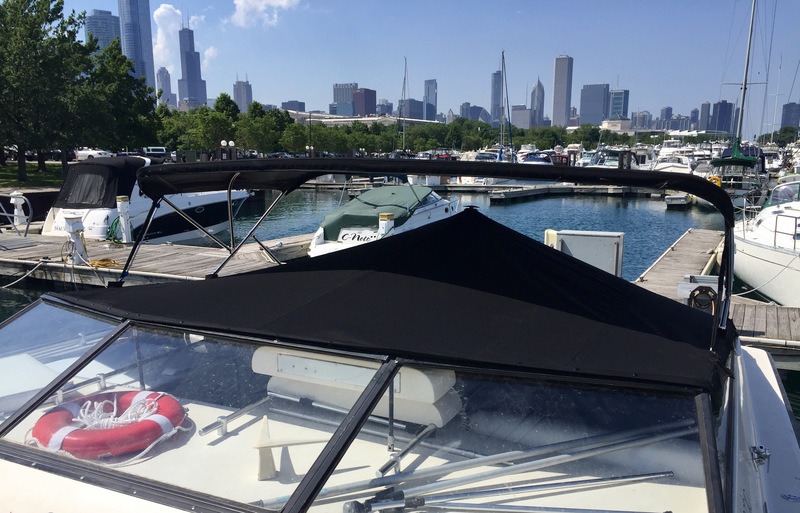 We used Captains Navy Sunbrella upholstery fabric to match the new closure we created for them! These cushions have an Oyster Sunbrella piping around the edges to help create the illusion that these are all one long cushion! 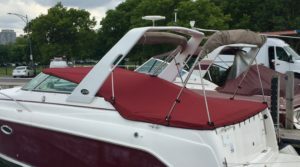 They also have two easily removable headrests that have pockets in the back of them for storage so that things don’t go flying away when you are out and about. They are attached to the boat with custom velcro straps that wrap around poles located down each side of the center of the boat. 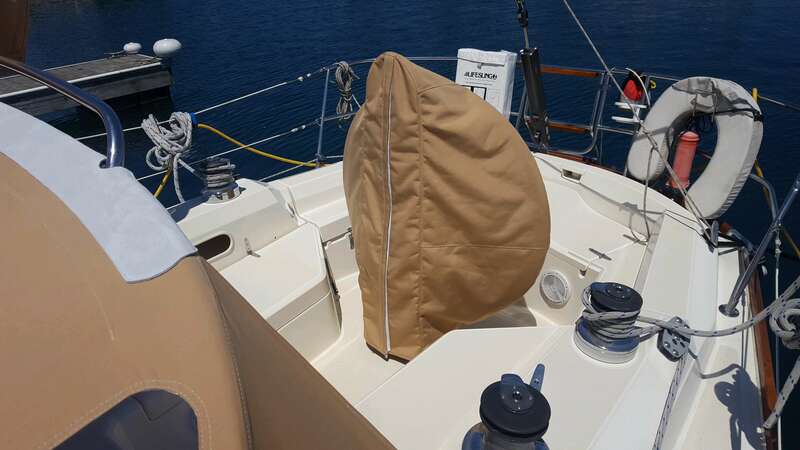 These cushions aren’t going anywhere but where the boat takes them! They are made out of active foams dryfast foam. Dryfast foam is an open-cell foam that allows water to go through the foam instead of absorbing it like other foams. These cushions will get dry way quicker if they get wet out on the water or soaked after a rain storm. 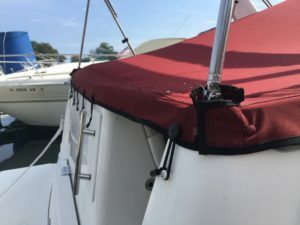 They also have a white screen on their underside to also help with water drainage along with a large horse shoe shaped zipper for easy removal if the customer wants to throw these in the wash at the end of the year. 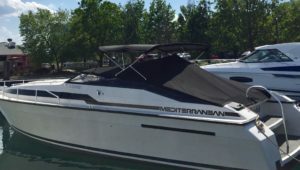 This 42′ Silverton Express Cruiser was in desperate need of an updated cockpit cover. 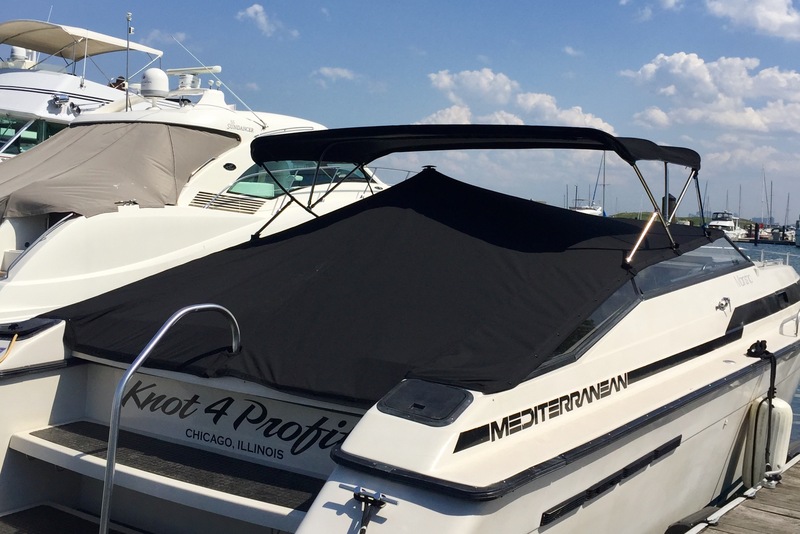 Here at Chicago Marine Canvas, we only do custom work, that means, no two covers area alike! 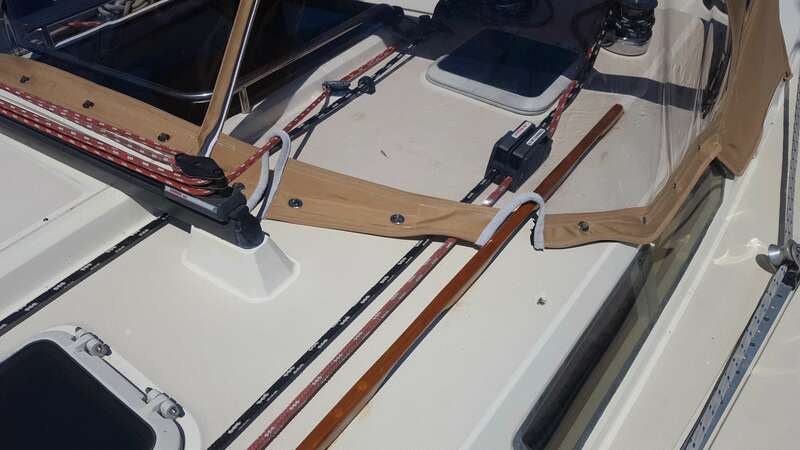 The first step to our process is to physically go out to your boat and take measurements using our 3D measuring device. This is one of our many cost-effective, labors-saving tools. After we quickly gather our measurements we head back to our shop to begin our design process. We do all of our design work on the computer using CAD (Computer-Aided Design) software. With this tool, we can see a 3D version of your new cover before we even draw it out! This way we can make sure that everything is perfect and all of your needs are met. 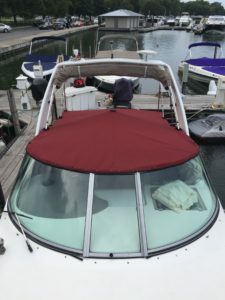 For this cockpit cover we used Erin Green Sunbrella Plus fabric, which has a polyurethane backing on the inside of the cover, it helps really ensure water resistance for this boat cover! We also used GORE Tenara thread in clear, which has a lifetime guarantee to outlast your canvas! 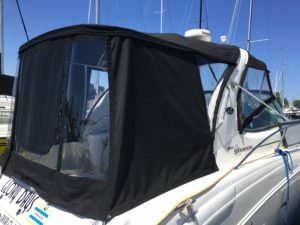 This thread is great for boat covers because it is UV resistant and wont wear out over time! This cover also had two Boat Vent II pole holders helping to prevent water from pooling on the cover, and to help create airflow through the boat while the cover is up. This can help prevent mold and mildew from building up inside the boat cover when its up! 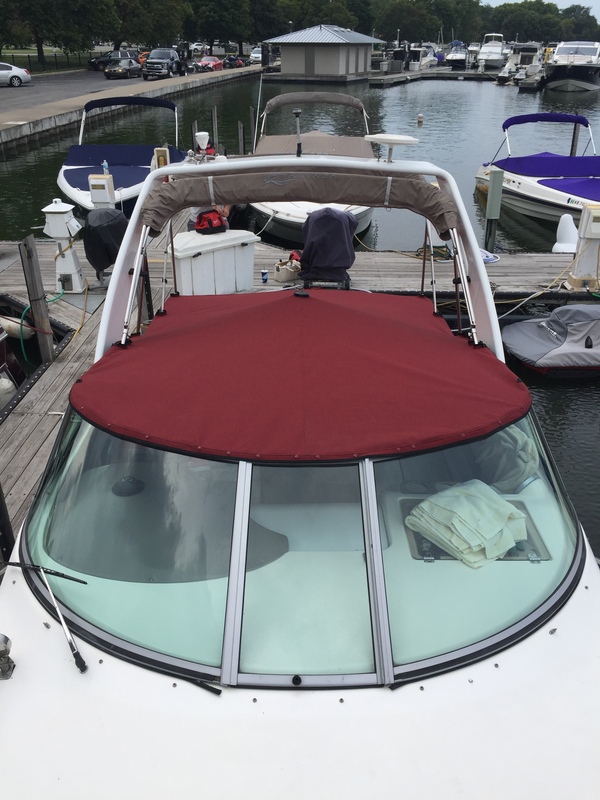 We used DOT Snaps to attach the cover to the boat to finish it off!